With the BBC's loneliness project revealing that young people are amongst the most likely to feel lonely and often find it hard to meet new people in a meaningful way it is more important than ever that we find ways to meet new people. Here, GoodGym runner Tom Clark writes about how and why meeting new people on a GoodGym run isn't too difficult. To paraphrase Blur, sometimes modern life can be a bit rubbish. Community is less of a factor in most people lives than it was for their parents and grandparents - it’s likely that not many people reading this post will have grown up, studied and worked in the same community their whole lives. Moving to a new place is an exciting time, but it can also be a lonely one. Whether you’re new to an area or have lived there for years, if you are feeling a disconnect from the place you live then GoodGym is a fantastic way to meet people in your community and get to know your surroundings a little better. 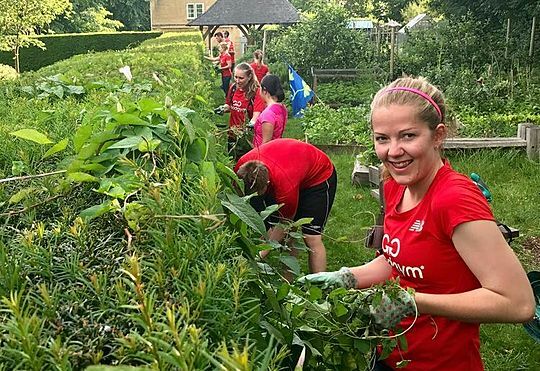 I wanted to find a way to escape the student bubble"
Emily Jones was a student in Bath when she decided to try GoodGym. ‘I wanted to find a way to escape the student bubble and meet some different people in the local community’, she says. ‘I chose GoodGym because it was also a great way of motivating me to keep fit. I'd always wanted to run a half marathon and this felt like a good, sociable way to ease myself into running. I didn't know anyone in the local area"
Before long the new people you meet at GoodGym can become new friends. And who knows, maybe more! staring at a screen all day"
If meeting new people is the goal that gets you to come to your first GoodGym, there may well be other goals that keep you coming. ‘It's a way of me forcing myself to exercise every week and I always feel better for it’, Emily says. ‘It's amazing for my mental health after sitting in an office staring at a screen all day. knowing your area better than you’ve known anywhere else"
GoodGym can undoubtedly change how you feel about where you live, and you may even find yourself knowing your area better than you’ve known anywhere else thanks to GoodGym. ‘It's a great way to meet others who you may not meet otherwise, get involved in the community, learn new things and see new places you might not even know exist’, Ella says. ‘I feel like I've got to know more about Colchester (both the good and the bad) from a year living here than I have about anywhere else I've lived for much longer periods of time.